Getting out of our car to see the elephant seals was the first moment we realized that we were not in Los Angeles are anymore. It was COLD and WINDY, and I was NOT ready for any of it. I stuck it out though, and the elephant seals were pretty cute and amusing. But like every beautiful place in nature, it comes with a back story on how humans have altered it. Elephant seals are the largest of their species, and can grow up to 16 feet in length, weighing in at about 5,000 pounds. Like every animal today, they have been hunted, and their habitats have been destroyed, near to the point of extinction. They used to live in remote coves and beaches far away from humans, but in 1990 people started colonizing those areas. 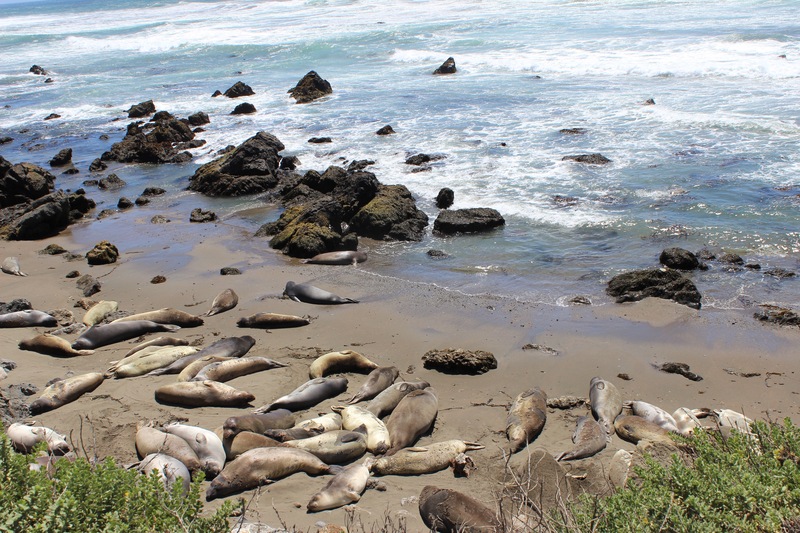 Now you can pull off the Pacific Coast Highway to see hundreds, sometimes thousands of elephant seals laying on the beach in Piedras Blancas. This used to be a rare sight, something one would expect to find in a National Geographic magazine. But now it is a total tourist attraction. Though the photo doesn’t really do them justice, the seals were actually pretty lively creatures. They were boppin’ around, throwing sand on themselves and each other to keep cool, and sometimes having a small spat over where to they wanted to lay (which was often on top of each other). This was the fiance’s find on the trip, a secluded 80-foot waterfall in Julia Pfeiffer Burns State Park. If you look really hard at the back of this GIF, you can see the waterfall coming down onto the beach. The falls are named after Christopher McWay, who homesteaded the canyon in 1870. Helen Brown, another settler in the area, purchased Saddle Rock Ranch from McWay and named the creek and waterfall in his honor. She also named the park in which the falls resides after Julia Pfeiffer Burns, a “true pioneer” of Big Sur. One of my favorite parts of pulling off on secluded stops on along the west coast has been reading plaques about the pioneers, which are mostly Lewis & Clark in the Pacific North West. But in Big Sur Area, it’s all about the Browns and the Burns. The entire park is now closed, as well as surrounding areas, due to the Soberanes Fire that has been tearing through Big Sur for the past several weeks. 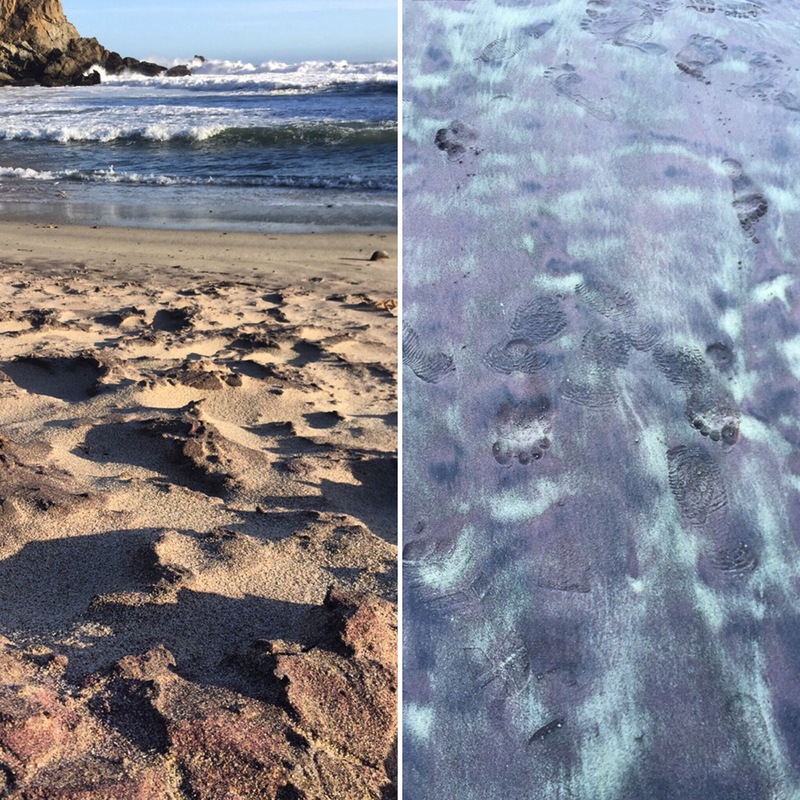 Also known as “the purple sand beach in Big Sur.” The sand really is purple, unlike the black sand beaches of Humboldt which are really just made of black rocks. The amethyst hues of the sand look like they came from fairy dust, but are in fact a result of the heavy minerals that inhabit it, mostly quartz and garnet. This is one of the most photographed parts of Big Sur. 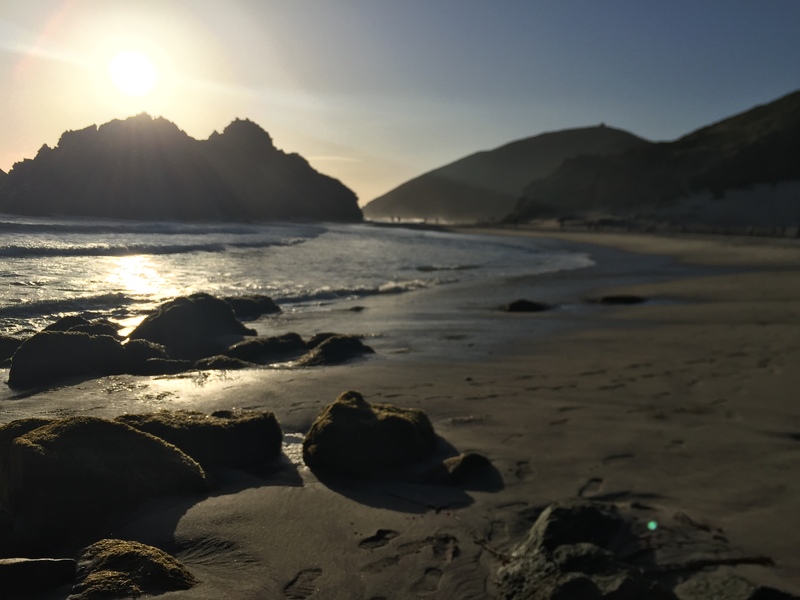 I also enjoyed it because it was the first time I could get on an actual beach on the coast (mostly due to our time crunch of having to get to San Francisco by nightfall). The extreme force with which the waves crash from the Pacific is exhilarating. Some history of Big Sur’s settlers: The Browns were the first to own land that is now Big Sur, though no one quite knows how they came to be there. Julia Pfeiffer Burns was a daughter of the first settlers in Big Sur, Michael and Barbara Pfeiffer, who arrived at the area in 1869, when Julia was just under a year old. Julia lived as a single woman most of her life, leasing land from the Browns and living with her parents well into her forties. In her father’s old age, Julia managed the family ranch. First piece of advice is – definitely do this! Driving up the PCH is so relaxing and beautiful. Seeing such a long stretch of untouched landscape without any phone service to distract you is good for the soul. Second piece of advice – figure out where you’re going to eat ahead of time. The coast is pretty barren save for a few private residences, and there is no cell service at all. So pick your lunch spot beforehand. We ate at Ragged Point Restaurant, which had average food but beautiful views. 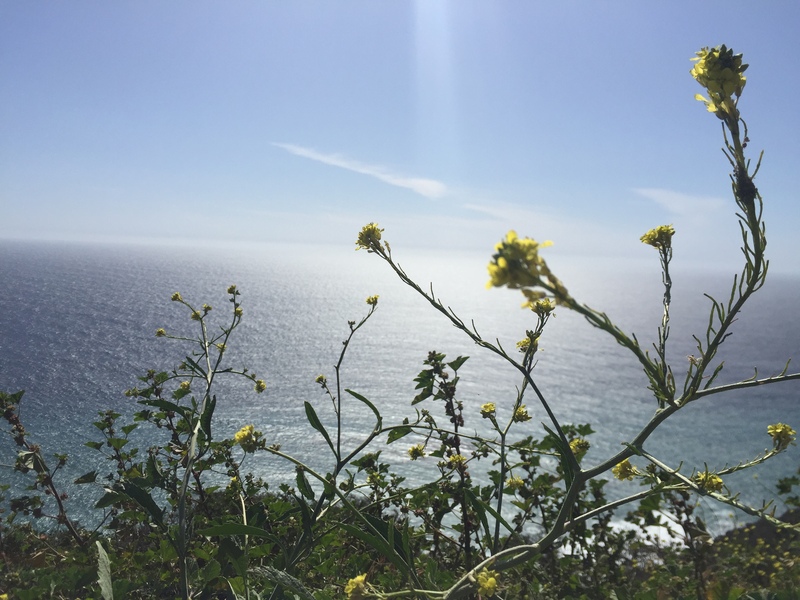 Third piece of advice – get gas before you get to Big Sur. If you’re coming south, get gas in Carmel. And if you’re going north, I would stop at the cheapest spot you find. Gas is scarce and very expensive in Big Sur. Last piece of advice – take your time. The road is has a lot of sharp bends and turns, and you will need plenty of time to look around and take in the views. Drive slowly, everyone else will be doing the same, and allow yourself to pull off and take some photos. There are many places that you can go back to and visit, but making an entire drive like the PCH twice is not exactly an outing you plan often. Even if you try to speed through it, the PCH will stop you from doing so. So relax, and appreciate the now.